X to Land – Perfect landing and grind mechanic that rewards you for timing tricks to perfection, lock this down and mainline your brain into skateboarding's rhythm. Showboating – Battle online for the number 1 spot on EVERY mode, squeeze in that one extra trick for world dominance. Ride the World – Five different stages, each with their own unique levels and obstacles, grind over JCBs in the junyard and Heelflip over Dinosaurs in Neon! Horizontally Challenged – 250 unique and cunning challenges, honing your skills, pushing you harder and harder - will you step up? 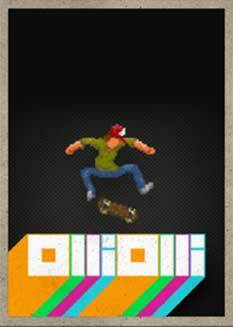 Strike Gold – Find the Golden Skateboards hidden somewhere in the game, no clues here though we are afraid! Muzak Sick – hand-picked soundtrack including the Qemists, Dorian Concept and Flako. Who'd have thought jazz and skateboarding would go so damn well together?